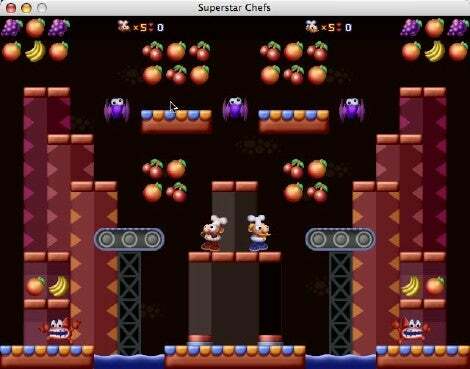 The premise behind Superstar Chefs ( ) — one of my favorite games by developer Mac Joy — is simple: someone has stolen the chef’s secret recipes and spread them all over Cocktail Land. It’s up to you to get them back. Under your direction, adorable, bug-eyed cartoon chefs must search every level, jumping to reach fruit change platforms, or avoid obstacles. Collect all the fruits on the screen and you’ll proceed to the next level. Troublemakers such as birds, fish, and crazy-eyed bats populate each level. You can try to avoid them, but it’s also fun to stomp on them for extra points. Each level is filled with colorful graphics, smooth animations, and a wealth of visual distractions such as conveyer belts, elevators, spikes, lifts, and cannons. The game’s bright and happy sound effects help to make this game cuter than a basket full of puppies. Every time I launched it and the music started up, my kids would appear out of nowhere to watch me play, comment, and hum along with the music. A Team mode lets two players operate on the same computer with the same keyboard. There’s also a Versus mode which pits two players on the same Mac against each other through seven levels. To play, you’ll need Mac OS X 10.2 or later and a 16MB OpenGL-capable graphics system. A downloadable demo version lets you check out the first few levels before you buy it. The Bottom Line With Superstar Chefs, MacJoy has produced a delightful and addictive arcade game that’s suitable for the whole family.